We created two different planning options for Sunstar Deutschland: in the monthly planning option, an activity (visits, trade fair, meeting, office, holiday, etc.) is selected for each day from a menu. A sales route or a region/city can also be allocated to the day. A PDF can be generated from the monthly planning function at the press of a button or all of the appointments can be entered in the calendar. Fine planning is carried out in the weekly planning system. Here customers can be filtered by post code, location, frequency of visit or the due date for the next visit, and a visit can be scheduled. With both planning options, all of the selected customer visits are automatically entered on the calendar and appear as activities in the customer account for the planned visit. The course of each day can be determined in the calendar itself by drag-and-drop. The field sales team can now schedule and plan the required number of visits per customer per year via Salesforce in a fraction of the time required in the past. 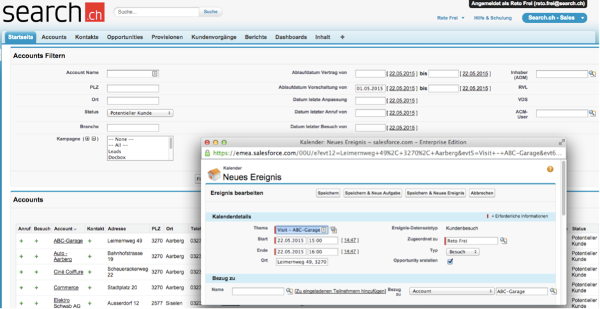 We designed a special view of Salesforce for the field sales team of search.ch, the Swiss search and information service. Here the sales rep only sees the accounts relevant to him. He can filter these using various criteria, such as location, last contact or industry, and record telephone contacts and plan appointments directly in the view. All of the appointments are saved in the Salesforce calendar and he does not need to keep any other diary. He documents the outcome of customer visits in Salesforce with «Contract concluded» or «No contract concluded» and enters any contract number. This data is imported into the ERP system via the interface and the commission calculated is sent back to Salesforce. Sales therefore has an up-to-date insight into sales performance for the month – a large motivational factor. For one trading company, we created a structured process from selection of the customer to visit, via the visit report, to evaluation in Salesforce. The sales rep selects the customer to visit in list views with predefined criteria (A-customers, visit frequency, region, etc.) and adds them to the calendar by drag-and -drop. This automatically creates an activity in the customer account and a visit report. 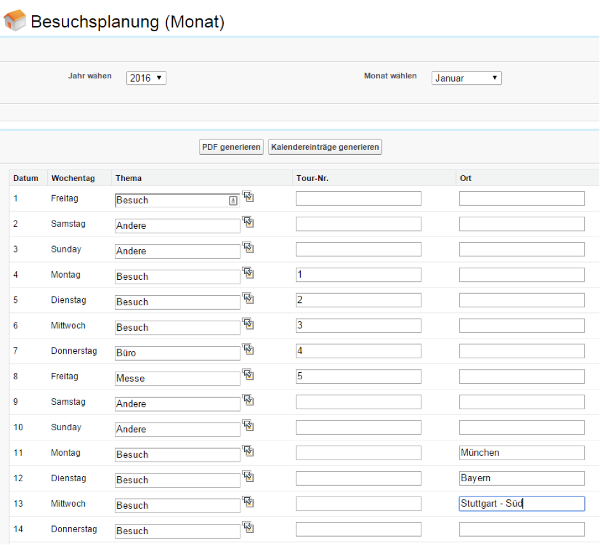 In the visit report, fields such as date, location, participants and a description are already completed. The rep can then record data with predefined pull-down menus, create notes and carry out the store check in a structured way. In addition, the availability of the company's own products and the most important competitors are recorded. Promotions can also be managed via the system. For another customer in manufacturing industry, the arrival and visit time are noted on the report, together with the potential and targets. Another production company is able to create confidential visit reports in Salesforce. The "Private report" function is used for this. The same fields can be completed as in the normal report and a section of free text added. This report is also saved to the customer account but can only be viewed by the relevant personnel; however, the structured data can still be evaluated. We have also linked visit planning with the visit report for a customer from the drinks industry. The sales rep plans his customer visit on the Salesforce calendar. This automatically creates a visit report. Possible discussion topics (product groups) that he plans to cover are then recorded in the report. He can also include other preparations. After the visit, he notes the outcome and the anticipated sales. He records his expenses and the mileage on his company car directly on the report. The daily and monthly sales figures are created from these reports and he does not have to claim his expenses separately. The visits are very easy to evaluate, thanks to the predefined fields. You too can make your sales department more efficient with a tailor-made visit planning system with integrated processes in Salesforce. Get in touch with us and find the ideal solution for you. Field sales staff usually visit several customers a day. At the moment, you often have to spend time identifying which other companies are in the immediate area. PARX Geo Location Integration makes it possible to do this with just one click – even on the move! Field sales executives select their own potential customer using a view specially created for search.ch, plan their weekly visits and document the outcome of their negotiations. As a result, management has a clear insight into the activities of its field sales.